In website builder WebWave element Gallery allows you to add to your website a photo gallery. In this article, you will learn how to build a website with a gallery. 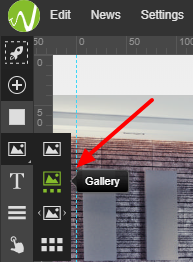 In order to add a gallery to your website, click on the Image icon in the toolbar on the left side of the builder and drag and drop gallery icon to your website. In the gallery, there will be added some default photos. You can easily change them in "Edit content" section. Slide - a current photo will move to the side and be replaced by a new one. Fade- a current photo will fade away and a new one will take its place. Crossfade - a current photo will smoothly change to a new one. Explosion – a current photo will be divided into many pieces, change to a new one and go back to being whole. Windmill – a current photo will be divided into four pieces, which move in different directions and reveal a new photo. Door– a current photo will be divided into four pieces, which move on sides and reveal a new photo. Tils – a current photo will be divided into four pieces, which fall and reveal a new photo. Stretch - a photo gets unproporctonally streched so it fits the whole frame. There are no empty spaces in the frame and no parts of the picture get cropped. Should photos change automatically or after urser's click. 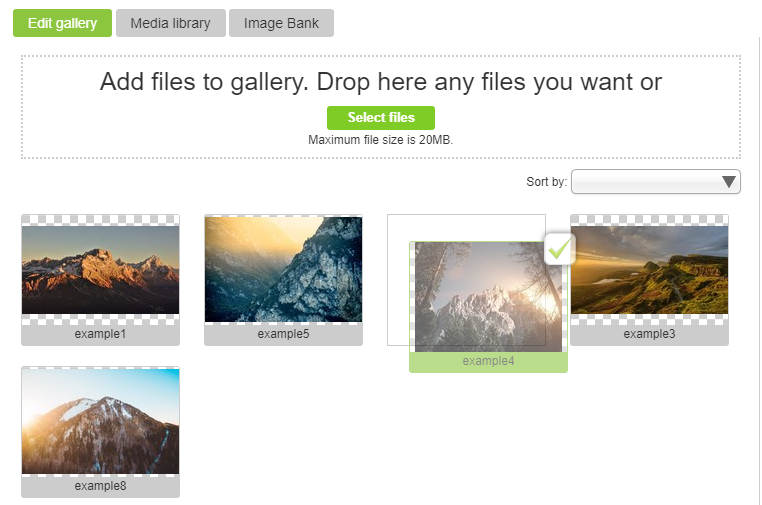 Width and height - set width and height of photos thumbnails. 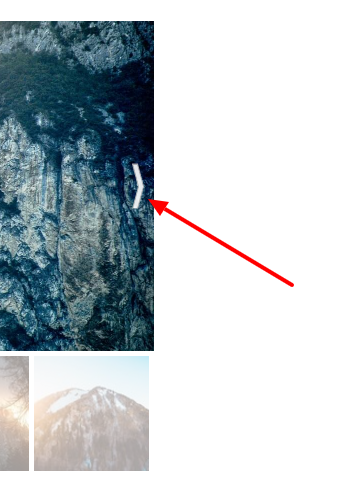 Arrows - should navigation arrows allowing a user to move around gallery be displayed. Distance from edge - set arrows' distance from gallery edge. In order to add photos to a gallery, click on it and select "Edit content". Photos are added to gallery through media library. At the top of a new window select "Media library", choose photos which will be in your gallery and press "Add to gallery" button at the bottom of the window. More about media library read here. In order to remove photos from the gallery, click on it and select "Edit content". Choose a photo you want to delete and in File details select "Remove from gallery". 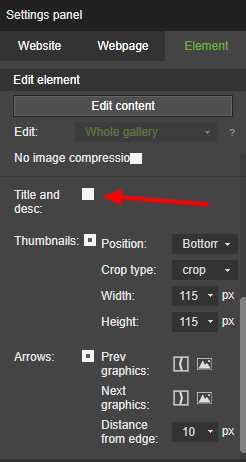 In order to change photos order in the gallery, click on it and select "Edit content". Drag a photo and drop it in a place where you want it to be. 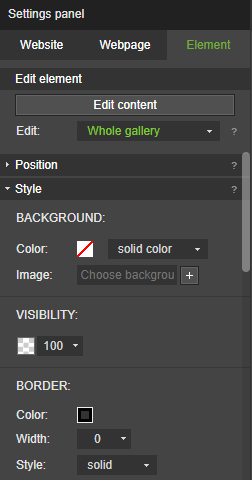 In a side edition panel select "Gallery settings". Tick a "Title and desc" box. Double click a text field on a photo. 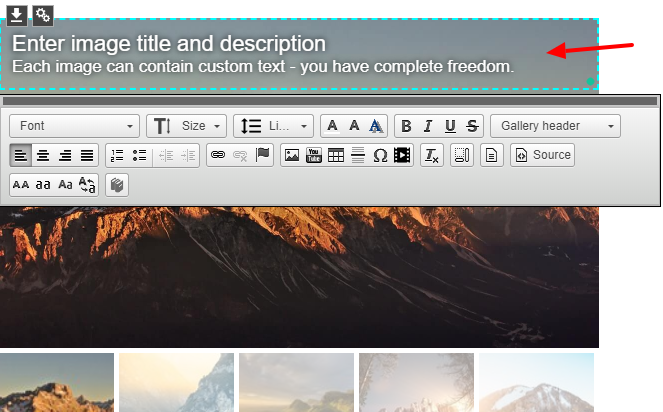 Enter any text content and edit its style just like in any other text element. 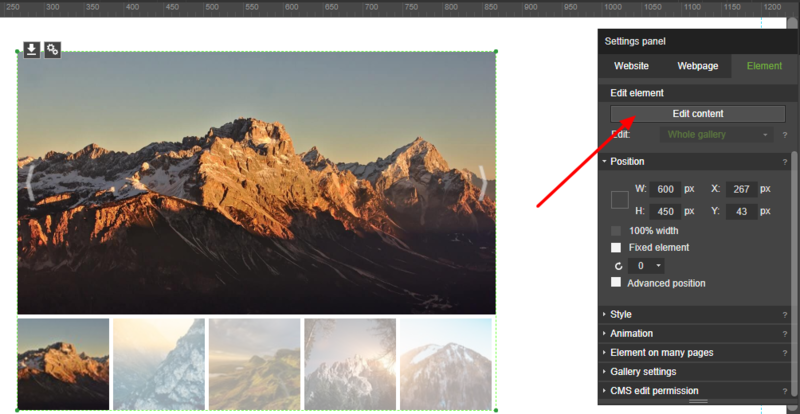 In the Settings panel you can set text alignment on a photo, text background color, text and element transparency and more. To edit next photo just click on a navigation arrow in gallery.